could someone show and or tell me how to correctly import bvh files into Carrar 8 and attach the skeleton to the character. I heard evilproducer tell others that, if you select the hip of the figure, and then go Import > BVH, it will load onto the chosen figure. BVH is, of course, possible to be made for any sort of rigging. So the closer the match to what you wish to use, the better. Luckily for us, whom like to use DAZ and Poser figures, many BVH exist for these. Genesis adds some new bone to the rig. With the Genesis rig, most poses and animations made for earlier generations of DAZ figure, like M4 for example, will still import, but the feet will have obvious problems, where sometimes the rest is actually quite useable, thanks to the new bones. You see, these new bones didn't exist in the earlier versions, so no information gets recorded there - so we can freely use Abdomen 2 and Pelvis to straighten out the posture or realign the legs respectively. Rotating the Pelvis controls the angle of both legs from the hip, while the Ab 2 rotates between the chest and abs, so between the two, the possibilities are great. In Carrara, we can easily fix the feet at the first frame, and this will often fix, for the most part, the entire animation at the foot. Now locate one of the feet in the timeline hierarchy and open up the hierarchy of the foot by clicking little white triangles, to get to the rotational values. With the foot selected while the Rotate tool is active, you can see that each of four loops around the foot have a different color. Yellow, while quite handy for hand editing, should be ignored for this step. It rotates freely according to camera view - given that nothing is locking the said movements. I want you to look at the red, green and blue. Notice that these colors conform to the little x,y,z icon on the lower left of the scene view. So if you need to rotate the green loop to correct the majority of the issue, you'll see that you need to adjust the y axis rotation. Drag the Y rotation dot up or down on the graph until the foot is straight along that axis, then tweak the X axis if needed. When you do this in the graph editor on frame 0 like this, the changes should take place globally across the animation - so go and do this for the other foot too. I know this sounds like a big PITA, but it really isn't once you do it the first time. 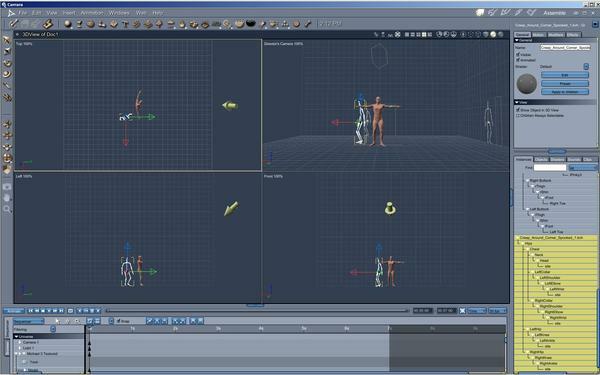 You can also import a BVH file and select the resulting skeleton and make an NLA clip of the animation. Now you can work with this clip in several ways - so if you like it, don't forget to save it to your browser or you'll lose it when you close the scene. NLA clips, when made, get added to the 'clips' tab down on the bottom of the right side panel. 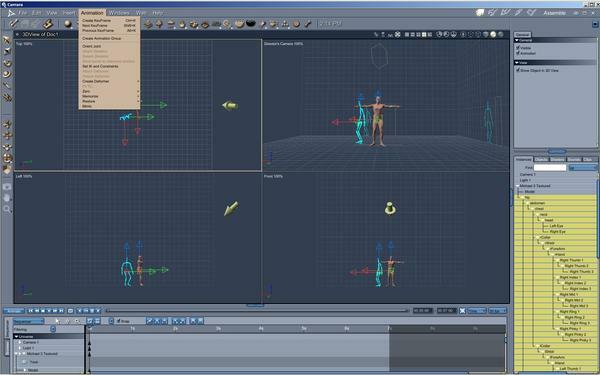 Drag a clip to a figures NLA track to cause the animation information to affect the character. In this way, you may stretch or shrink the clip to speed it up or slow it down, loop it, add an arc to it, all manner of things. Certainly more things than I've ever tried. Likewise, if you'd rather work with the keyframes instead of a clip, just make sure the clip is in the clips tray, select the figure and go to the NLA tab, choose "Load Data from Clip" and then select the clip. This will load the keyframes from within the clip onto the selected character into the timeline for you to edit freely. You may then save your work into a new clip to be reused on other figures. The more you play around with this stuff in Carrara, the more fluid it all becomes. Dart, could you make a screenshot with the skeleton of Genesis ? There are others here with far more experience using .bvh files. Or at least there were. ;-) Wendy may have more experience with it, although I think now she mostly uses .fbx. The rig is important. If you're using one of the pre-Genesis DAZ figures or one of the classic Poser figures from before Smith-Micro and DAZ decided to have their little rigging war (ala Triax), then you'll want to use Poser specific bvh files as the bones match and you'll have less errors. You do have the option I think of using the bvh file as the rig if I recall, but it's been awhile. I very often use .bvh and it is really an excellent base for an animation. Keyframes should sometimes be removed, but the final result is always very good. I tested .fbx and that does not function in c8. Any suggestions on the best method to get a bvh file into Carrara for use? 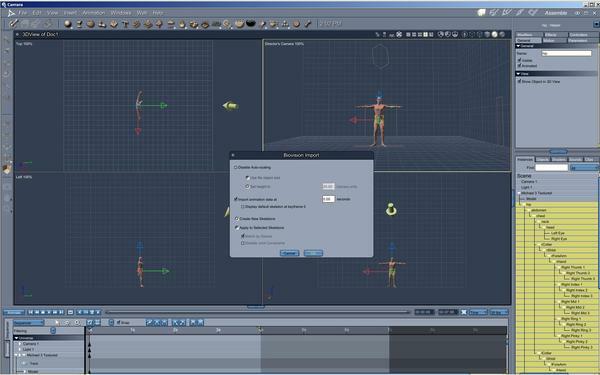 ok, thanks for the replies, but take a look at the screenshot and you'll see two options for importing the bvh file, one says create new skeleton and the other says apply to selected, my problem is if I select create new skeleton, how do I attach the skeleton to the poser character? In the animation tab that option is greyed out. I selected the hips that didn't do any good I selected the whole hierarchy that didn't do any good, so how do I import to Carrara? You should not create a new skeleton but apply to the selected skeleton (the hip). As I mentioned above, some .bvh must be modified (or do not function at all) but the majority function rather well. Those be-saying transposed for DAZ or to Poser often have problems too. I prefer those of Santa Monica Studios, they work well.